Hip Karma Hostel i Barcelona, Spanien : Boka nu! Hip Karma Hostel is a small luxurious hostel located in the heart of Barcelona. We offer comfy beds, free internet & Wi-Fi, free lockers, free bag storage, free maps, hot showers and kitchen facilities. 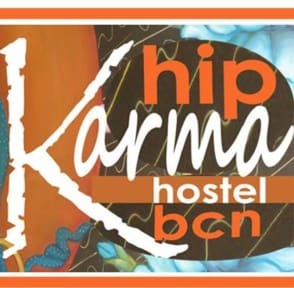 We are Hip Karma Hostel and we're proud to be rated one of Barcelona's Best Hostels. Barcelona is one of the top 10 most visited cities on the planet and Hip Karma Hostel has one of the highest ratings in customer satisfaction. We look forward to another great year of sharing Good Karma with all our guest. Hip Karma Hostel is not the typical hostel you'll find on your travels. We are a small, super clean, luxurious hostel that was built in 2009. Our style is simple and minimalistic, our design is functional and our facilities are top quality. Below is a short description of what you will receive when you stay with us. The rooms are dormitory style with bunk beds. You will receive a bed with privacy and security. All beds have stylish privacy curtains and reading light, so when you want a little privacy to read or work on your laptop computer you just simply close the curtains and turn on your light. All beds come with a free security locker. Inside each locker you have and electrical outlet. Here you can safely charge; your mobile phone, photo camera, video camera, IPOD or laptop computer. (You can bring our own padlock or use one of ours with a 5 euro refundable deposit) If you're traveling without your sleeping bag or towel you can rent one from us. Complete bed linen set and towels rent for 2 euro each or disposable linen set for 3 euro. I loved my stay at hop karma. Good location and The Staff was so friendly and helpful to us! The rooms was clean and i just loved the beds! We stayed in the 3 bed room. All was clean and the beds was really comfy. Felt more like a hotel than a hostel. A bit wierd to have the private bathroom at the other side of the kitchen and not connected to the room, but it worked. They did my laundry for me for 15 €, but the clotes wasn’t really all that clean when I got them back. Expert for that it was a really nice stay! Perfect spot in Barcelona!